.“What, that one?” I asked leaning down to get a closer look. I straightened up to take in the store. We were standing in the high-end watch outlet tucked away behind the security gates, passports controls and baguette shops of Heathrow. This outlet often grabbed my attention when I passed through UK airports on my way to a business meeting somewhere and on this occasion we had been drawn by the bright open door. While perusing Ibrahim had offered to show me his “grail” watch. A grail watch is the name for the one watch you would buy if money was no object. His choice was a mind-meltingly expensive Hublot. It sat proudly in a clear glass case near the back of the store. “And yet is shines in the light,” I remarked. Indeed it did though some alchemical flooding of light into the case from an unseen source. The almost black grey of the strap led up to a case of dark angles where the light was somehow simultaneously absorbed and reflected. Only once one reached the face did the effect hit you properly; the skeletal structure, a common feature on Hublot watches, pulled the focus of the eyes into the dial, searching through it for the bottom and the movement. This created an optical effect where the hands seemed to float on top. Combined with the eye’s journey up the strap and body, the effect of the face was to dazzle where it should repulse. It was, after all, a mishmash of a layout. 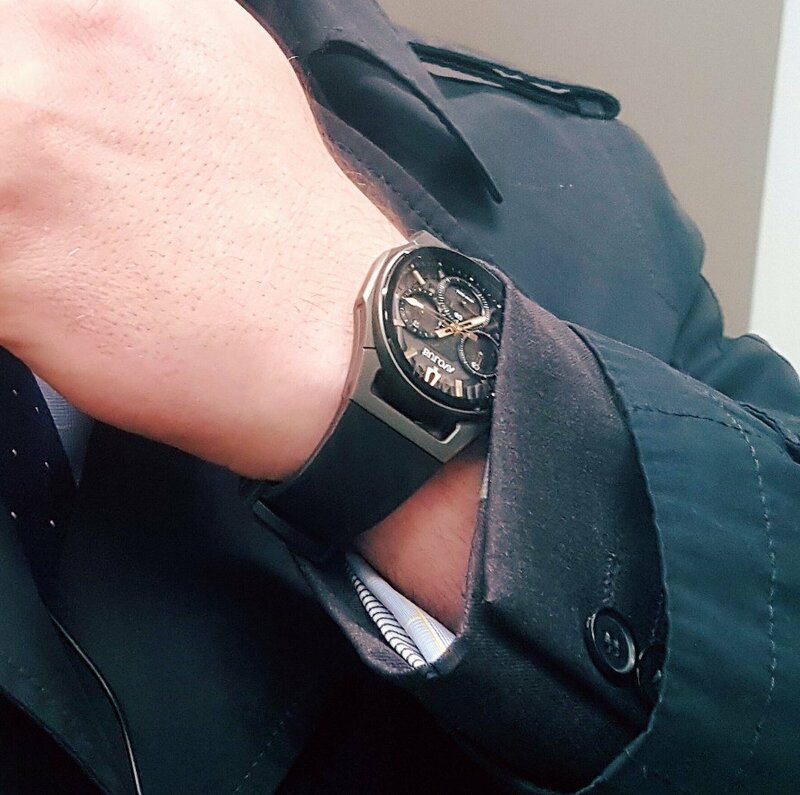 A photo of the watch would be easy to dismiss as foppish and crass, but in person it was dominating and on the wrist would lurk in the shadows of the shirt sleeves, pulling the gaze of onlookers like the galactic black hole it resembled. It was the sort of watch Batman would wear. “You’d have to upgrade everything else to fit it. You couldn’t wear it with anything but a handmade suit”. “This is a hand made suit,” he said making a gesture with his arms and a little annoyed. I smiled conciliatorily by way of apology. 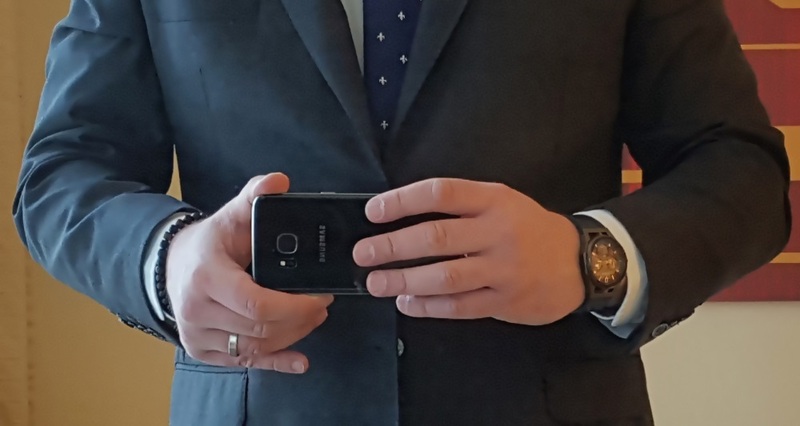 Well, that just goes to show, I thought, if someone who loves men’s business fashion couldn’t tell a handmade suit when they saw one then perhaps the watch is all that is left to signify a man of taste these days? Or perhaps I needed more coffee. “Bah, everyone has a Rolex,” he said with a dismissive hand gesture, “but this,” and his eyes glinted brightly as he peered into the case and the magical lighting caught them, “this is unique and different. No one will have one of these”. And then he smiled like Thorin beholding the Arkenstone. It got me thinking, I must admit. I love the cases of these super high-end watches: all boxy and angles where they traditionally would be smooth, all smooth where they traditionally would be hard edged, but if I was to splash out and buy one what on Earth would I do if I grew bored of it? What if it didn’t suit me or raised the same question of my couture as I had of Ibrahim’s? What would my wife say? In the many times since, when I have been in the same store or similar stores in various airports around the world, I have occasionally spotted the Batwatch again. Darkly shining out in Dubai or pulsating from a cold lit case in Amsterdam. Could there be an angular cased and skeletal dialled watch for the “normal” man? Someone without neither the reserves (or indeed the reserve) of Keith Richards? Something coming in under £1000, a brazen 14th of the Hublot’s cost, and yet retaining that unique and alluring pull on one’s wrist? Can the insanity of high-end watch prices be defeated by some new manufacturer, some mad, punk, startup outfit – who I imagined must be out there – all design-degreed-up and well in the know, and just as appalled by the wreckage left of the Golden Mean by makers like Hublot? A humble-priced Batwatch that still “evoked”? For a long time I believed that such an item would only be found in the true startup world of crowdfunding, where insanity is no barrier to flights of invention. 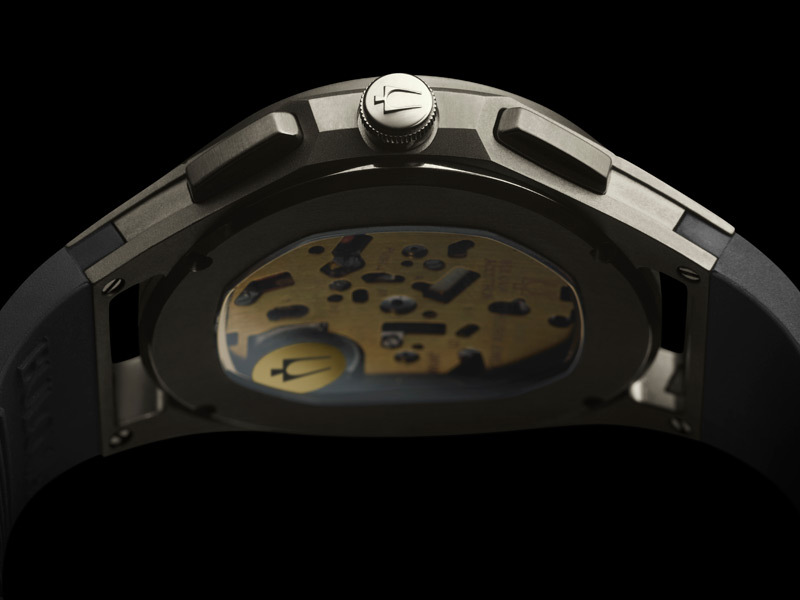 I would often peruse Kickstarter and watched for the angles and edges of the Bvlgari Octo’s and Richard Mille’s; but, I didn’t find them, or I did and would not trust that the project would ever get off the drawing board. It never occurred to me that a mainstream watchmaker would create a Batwatch. I had been looking at the Bulova moon watch replica and making my mind up on purchasing one when I saw it. There in an advert at the top of the screen, barely lit, and yet glowing, was a side shot of a curved case in bead blasted grey titanium. My aesthetic senses immediately noticed the lines that made up the shapes and came to the conclusion: someone had done it. 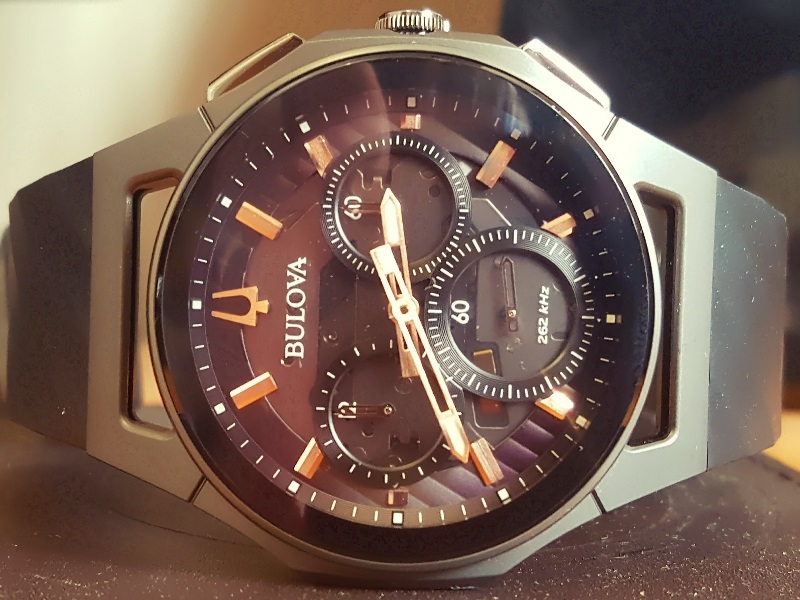 Someone had made a watch to compete with the high-end marks and it was, unexpectedly, Bulova who had stood out. Leaving the moon watch for another day I started on a journey through the web and falling in love with the Curv. 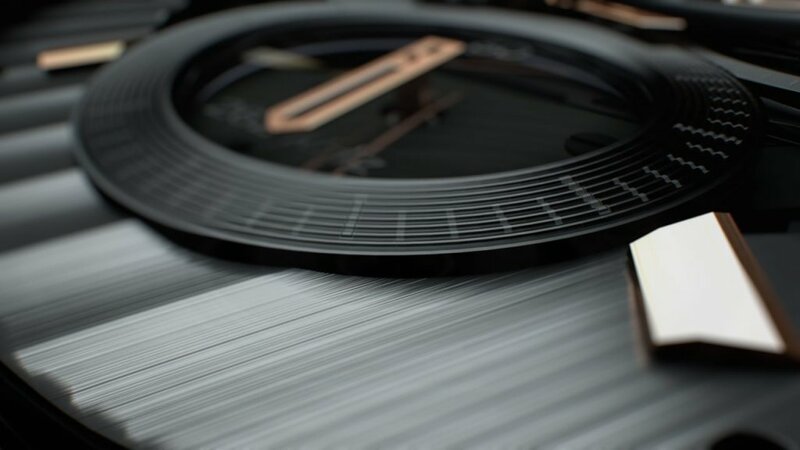 The Curv is sold as the world’s first curved quartz movement, and indeed this claim is very specifically true, catching all the blog headlines at Baselworld, and being widely reported by top sites like Worn & Wound and Hodinkee. I even found a positive comment from the Watch Snob himself, and if those august – if legendarily snobbish mansplainers – were entranced then I knew that pictures, like with the Hublot, would not do the watch justice and this would be a watch best seen in person. 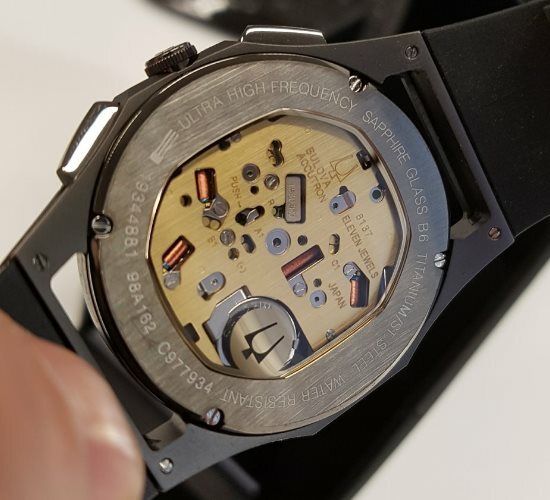 What everyone seems to have missed is that Bulova has brought out the first curved quartz movement watch; but, they are about 50 years too late for the title of the first curved watch in general. 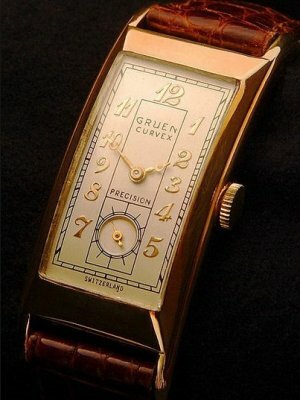 In the 1930’s venerable watch company Gruen brought out the world first curved automatic movement known as the Curvex. These lovely and elegant “strap” watches hugged the wrist and were marketed based on movie star endorsements, and the – somewhat shaky claim – that one could read the time while driving and without taking hands off the steering wheel. Guren has, of course, gone the way of the Dodo, and it is left to another classic pre-war make to take the stage; Bulova. Like many classic American makes, Bulova has a history going back to time keeping on the railways and through the World Wars. A time when wrist watches were essential tools. After achieving many “firsts” they were eventually sold to the Japanese giant Citizen. There something comforting and symbolic in the marriage of Japanese and American technology; that two very different cultures can war on one another so hard and yet be irresistibly drawn to each other. Truly opposites attract, and while high-quality Quartz movements can’t stand as the greatest of America’s many innovations (surely that honour goes to flight? ), it has benefitted from the Japanese love of time keeping accuracy and their indelible sense of style. And we are very much in the high-style section of the watch shop with this latest collection, particularly the two high-end models. 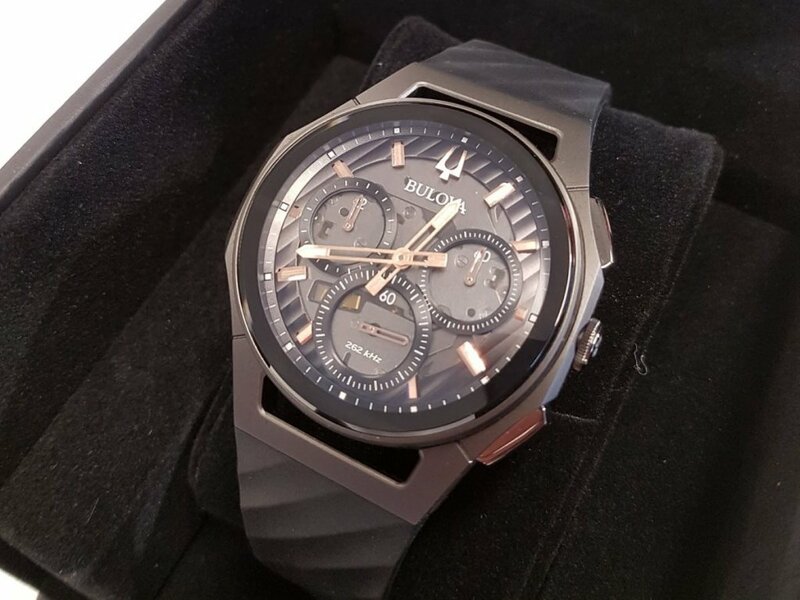 Thank you for purchasing your new Bulova timepiece. 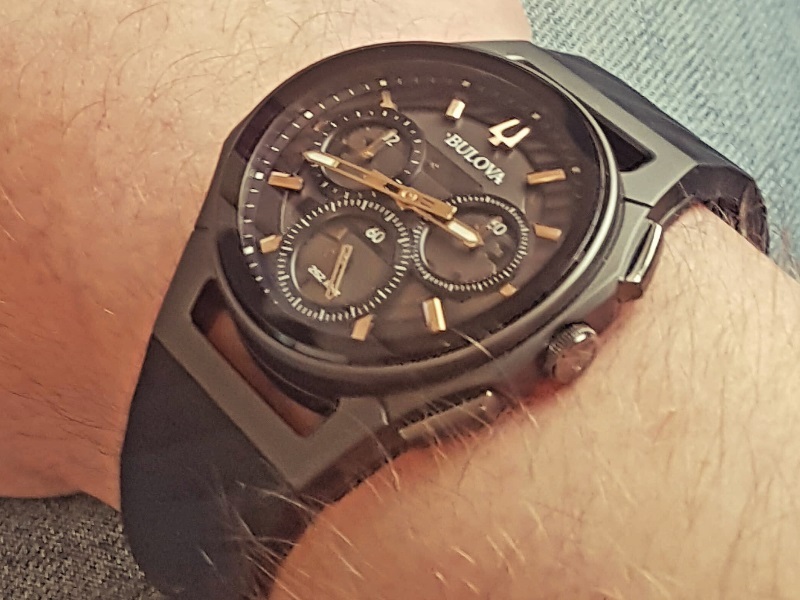 Since 1875, Bulova has been committed to providing the right quality and style for a rapidly changing world, delivering exceptional design enhanced by superior technology. 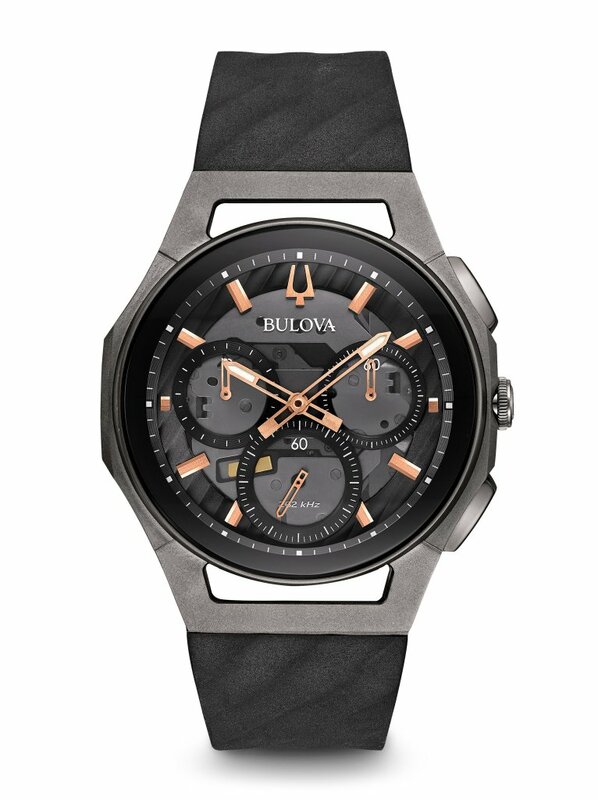 Your new Bulova has been precision-engineered and crafted of the finest materials. The following pages provide instructions on how to set and care for your new watch to ensure years of trouble-free timekeeping. The first thing that struck me about the Curv when I beheld it was not that, yes, it was actually curved in the movement and not some optical illusion of case design (this proof being clearly why they made the case back see-through), rather it was that whoever designed the dial had a magic light display case much like those in the Heathrow watch shop. For around the crystal’s edge, slightly overhanging the dial, is a non-reflective dark black line drawn completely around the circumference. Looking “under” this you can see the dial wall being slightly obscured by the line. So why is it there? Simple, when one beholds the dial, the line creates an optical illusion of parallax movement that throws the dial into a deep 3D, which is then enhanced by the layers of the hands, the shiny polished indices, and finally the movement at the base. You look into the face, not at it. It draws you deep inside where the light is coming in from all directions – enhanced by the curve – and bounces around the dial components throwing beautiful soft shadows and glints. Some talented Japanese engineer has spent countless hours with a torch creating this effect. No doubt working many late nights, missing his kids and neglecting his Karate in the pursuit of the ideal 3D dial. Well, unnamed hero, your work and dedication are appreciated here. As light plays over the crystal, the curve tends to force it into lines of reflection, so while the crystal is AR coated and clear as a koi pond, there are always playful reflections coming off the face. These also catch the pushers, which have been given a polished appearance. 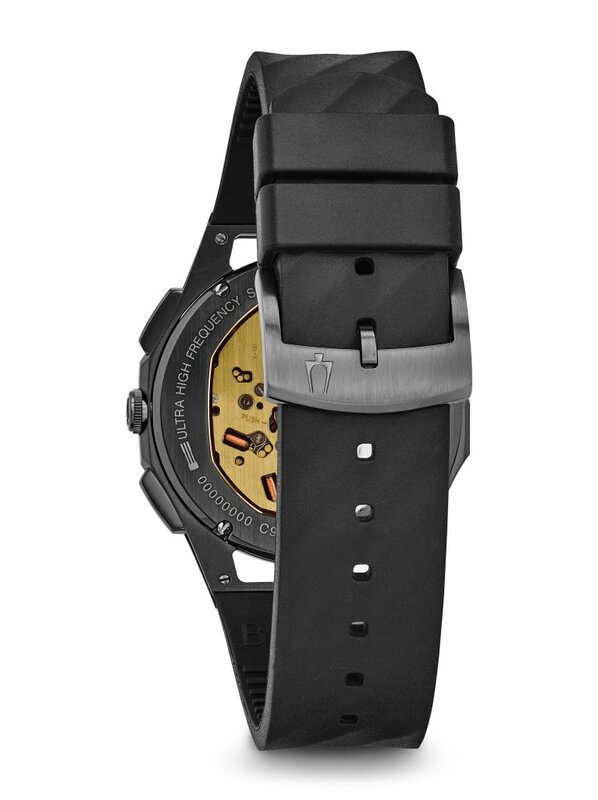 Set within the angularly, and aesthetically correct, bead blasted titanium case, the watch is always interesting to look at. I wonder how the steel version would play in this regard. 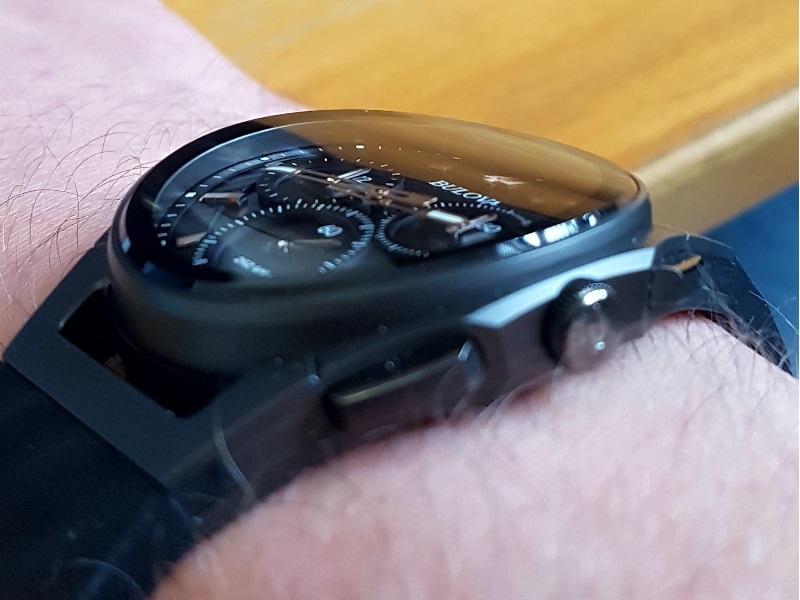 The extra brightness of steel could make the watch shine like a bike safety reflector, and I am personally glad I went for the Titanium. 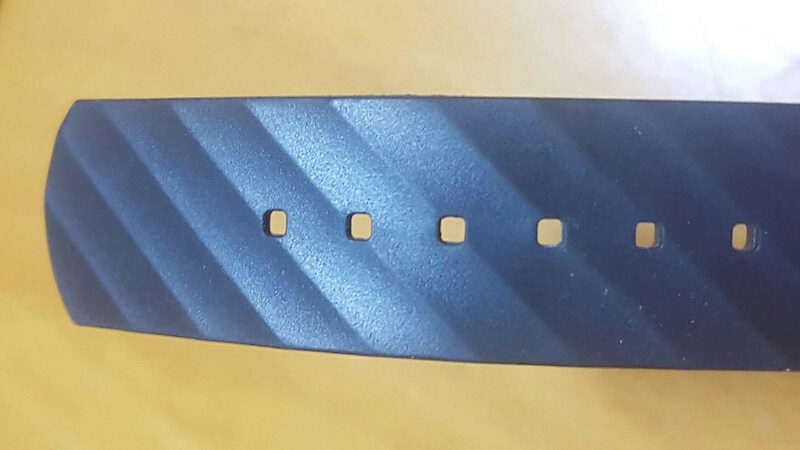 The case is the thin sandwich type found commonly in sports watches over 15k. It has influences from the highly respected designs of Gérald Genta, such as the Royal Oak, or the really modern design cues found in the Linde Werdelin and, of course, the Hublot’s. There are two pushers, which present the classic Chronograph controls, they work with a little twist I’ll cover below. The crown is a nonscrew-down type, reducing it to light wet use and not swimming or diving; however, it does have hacking seconds for accurate time setting. The main talking point of the case is, of course, that it is curved. The resulting body shape is not just a gimmick; no the case actively hugs the wrist and, being that it is so thin, it easily slides under shirt sleeves. 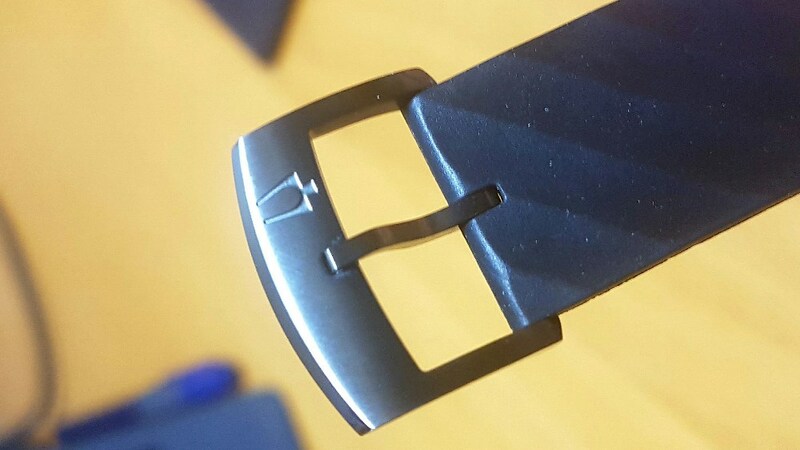 The holes at the top and bottom of the case, where the lugs would be on a standard watch, are cut out. This makes the case look like it is only a frame for the face and movement and also apes the effect of a traditional strap without curved ends. The detailing on the case is very nice, and the designer has surely put in the same count of hours as the face designer in the next cubicle. Watch photography is sometimes misleadingly alluring, but what does it look like without the shadows & lighting? One the back of the case is a sapphire see-through back displaying the movement. As quartz movements go, Bulova has made the best of the situation in the decoration, however there is no fine Côtes de Genève. It’s a nice look to expose the movement, although that name is possibly a misnomer as nothing “moves” that you can see. Around the case back is etched some text talking about the movement, waterproofness, and materials. 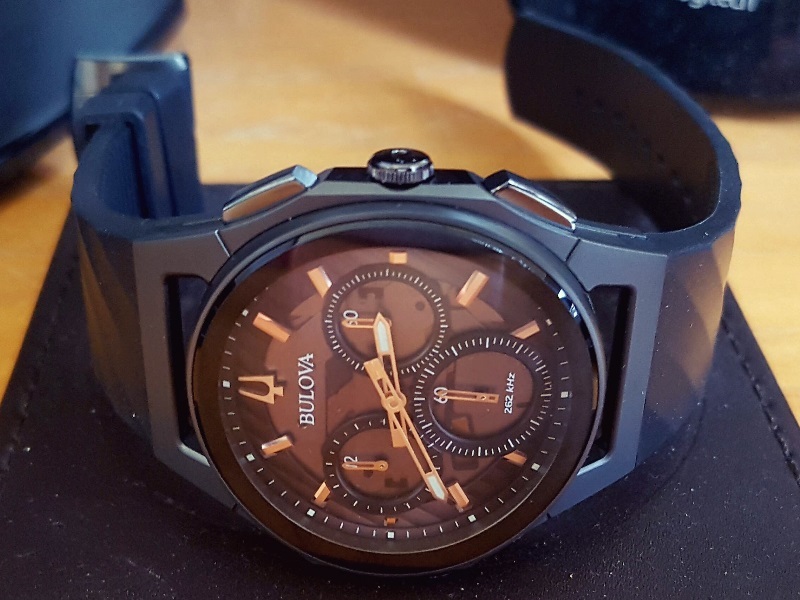 I think it looks really good and I don’t hesitate to take it off and show it when asked about the watch, which was something like 20 times on the first day I got it. 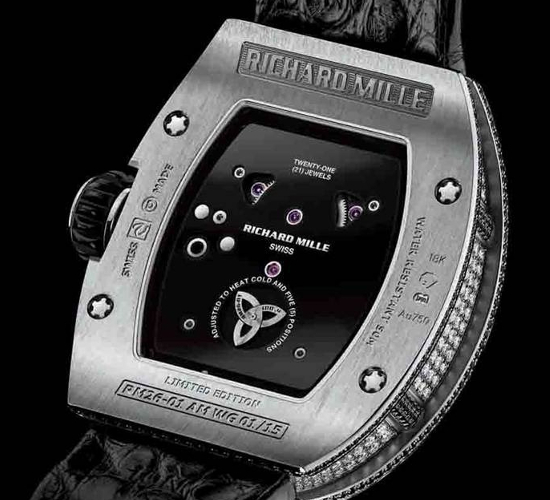 It reminds me of the build found in many Richard Mille watches, and I recall handling one in a mall in Jakarta – my English accent and business suit getting me a hands on in the store – and the look of the see-through back is very reminiscent. The cost, on the other hand, is literally £100,000 cheaper for the same feel. Bargain! 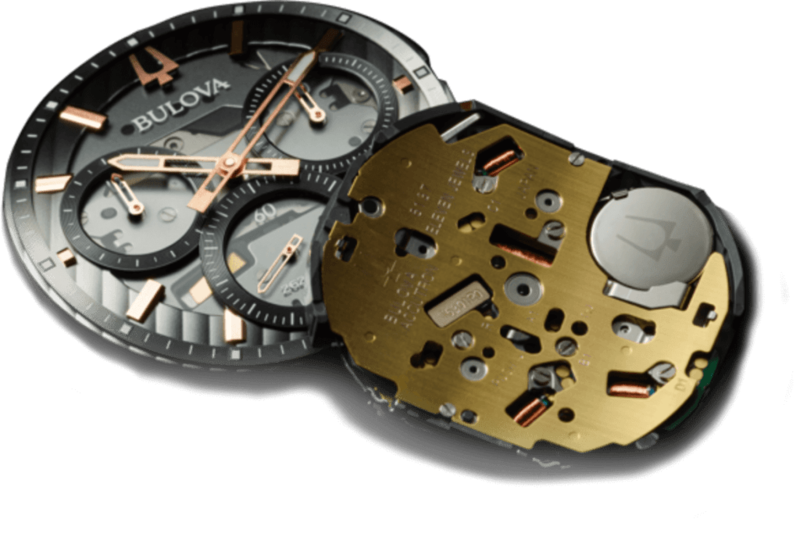 Bulova makes a big deal about their quartz movements and with good reason as they are accurate beyond one’s dreams. The Precisionist is a type of thermo-compensated quartz movement. 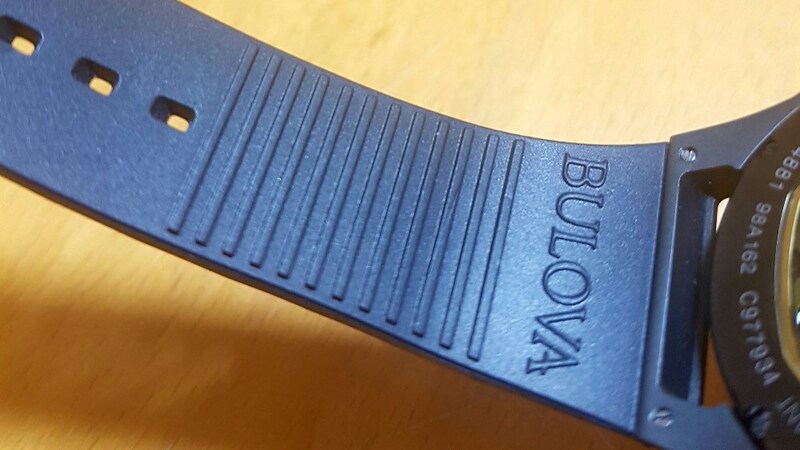 Bulova says that quartz accuracy depends upon two factors: temperature changes and vibration frequency. 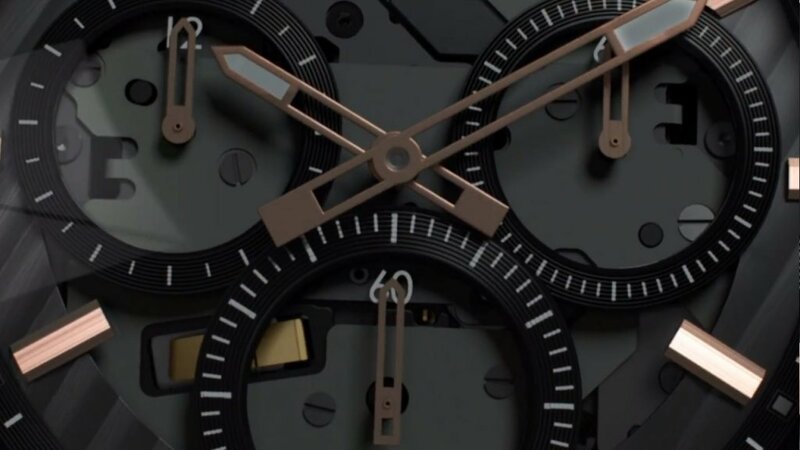 They have added a third “prong” to the quartz crystal and increased the vibrations of the Precisionist movement to 8 times the frequency of a standard quartz. High frequency movements are inherently more accurate because they are less susceptible to changes in temperature with finer count correction. Bulova’s oscillator is described as a ‘torsional resonator’ and their marketing department seem to suggest that the third prong in their crystal oscillator provides the 262 kHz frequency. Built from the inside out, CURV is engineered to perfection with first-ever curved chronograph movement and a high-performance quartz movement that vibrates at 262kHz frequency for precise accuracy. 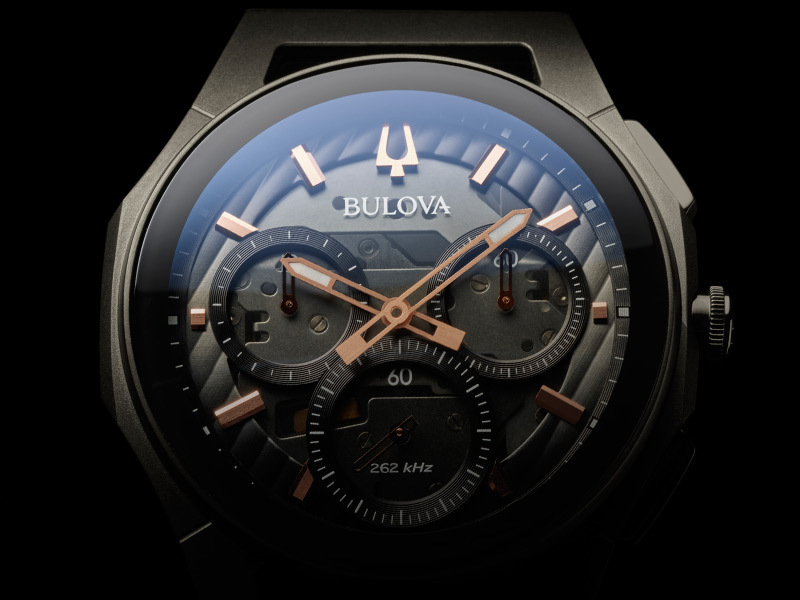 On the outside, Bulova’s applied design technology makes an aerodynamic statement with a refined, contoured simplicity that exactly follows the wrist. Combined with the hacking seconds, setting this watch to almost satellite accuracy is a joy. It will keep to that accuracy like glue and drift only 1-2 seconds per year. A super achievement. Other manufacturers with similar movements, such as Breitling, charge a huge premium for it. It speaks well of the brand’s history that they have managed to put this movement in so many watches. Of course, in this particular range, they have also managed to bend it like a sat-on iPhone in the back pocket. It is, however, a practical talking point, not just a gimmick. Moving on from the case we come to the strap. Rubber straps, particularly ones built to non-standard fittings, are probably the one thing that will hold this watch back. Some people just don’t like them. I personally wore a rubber strap all around the world on my travels and so know what to expect. Here, of all the elements, the designer left the office on time. Many of us have been totally spoiled by the incredible soft “rubber” straps on Apple Watches and now find that nothing else comes close. The Curv uses EPDM as its base, a well-known and resistant type. EPDM rubber (ethylene propylene diene monomer (M-class) rubber), a type of synthetic rubber, is an elastomer characterized by a wide range of applications. The M refers to its classification in ASTM standard D-1418; the M class includes rubbers having a saturated chain of the polymethylene type. While this strap is nowhere near as stiff as that found on a Gshock, which became a deal breaker for me on my last purchase, it does require a little breaking in. I will report back after a month on whether it becomes a little less rigid. On the top edge of the strap a series of angular carved embellishments have been cut, like grazes. Running my finger down these I can feel the bumps as they are not simply surface colouring. The effect they provide is to add colourful shading and light-glanced edges to one’s eyes as they play up to the case. I personally would have preferred a solid coloured strap. The clasp is excellent however; thin and customised to match the case, with a brushed body, stamped logo and polished edge. Very fine. If one can put up with a unchangeable strap, for I am personally a rampant strap swapper, then there is nothing to complain about. 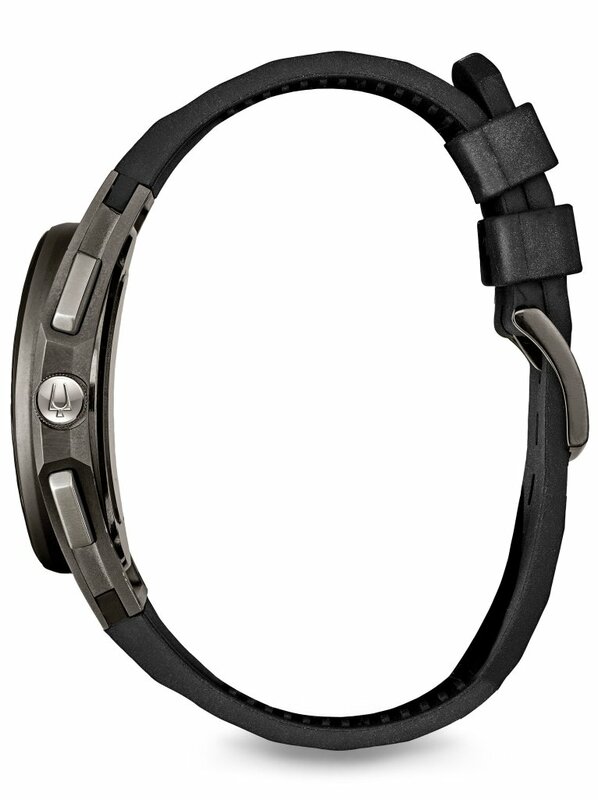 If you want a steel strap, then there are other models in the range. As the fitting and case are so thin, no third-party straps would work or could be modded to work. I would pay money for that Apple Watch strap though. Looking into the face one sees the layering at play. At the bottom of this sandwich is the dark movement. Layered over this are the three sub dials that run the chronograph and seconds hand. How the seconds works is neat. In normal use the hand displays the time in seconds. 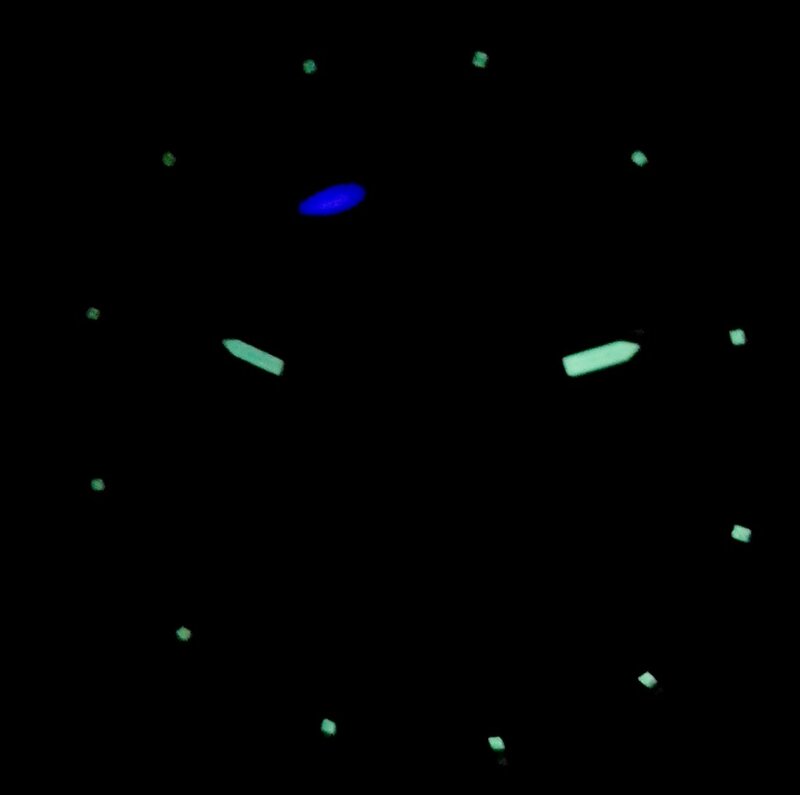 Once one presses the lower “reset” pusher the hand spins to the 12 position and becomes the Chronograph seconds. Stop timing and push again and it jumps directly back to the running time seconds. Exceedingly clever. This means that as one comes up to the skeletal hands, there is no large seconds hand. The hands have lume at the ends and are curved to follow the case crystal above. Their curvation is at the same ratio as the case and this means they don’t look out of place and enhance the experience of looking at the time from an angle. The indices are polished rose gold on my version and blue on the steel. The warmth of the rose, tastefully not overdone, is welcome and they are cut with multiple polished facets so that they shine merrily whatever the angle. 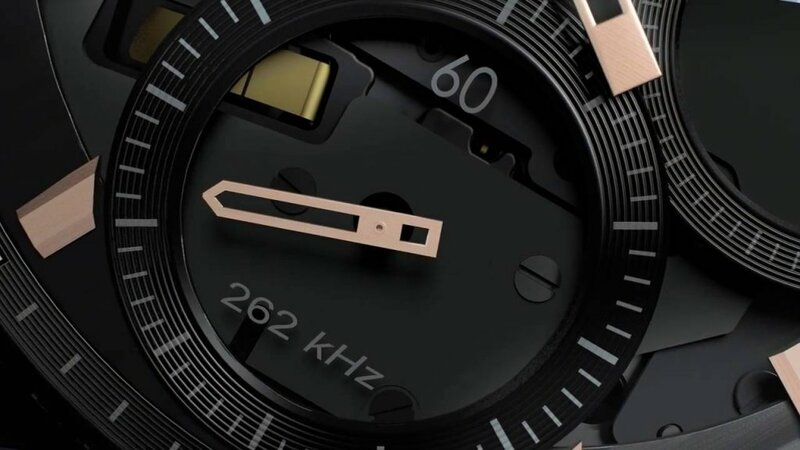 The 12 indicator has been replaced with the “tuning fork” logo of the Bulova brand and it has been done as sensitively as could be wished for. The text on the face is painted in matt bright white and around the indices is a patterned disk with the same shaved effect as the strap. Thankfully it has no date window and the watche’s fundamental use of looking at the time is simple. It is not, amazingly for a 3D dial, messy in any way. The dial is, together with the curved movement and case, the best feature of the watch and that is 100% as it should be. A lovely work day delivery for once! This watch needs little in the way of talking points once one sees it in the flesh. It is thin and elegant like a supermodel while being large faced enough to have wrist presence. It is designed to the hilt and right up to the line of taste. Any more and it would have been possibly crass and be suitable only for Russian mobsters, but do not worry: I couldn’t find a millimeter that is over-the-top. 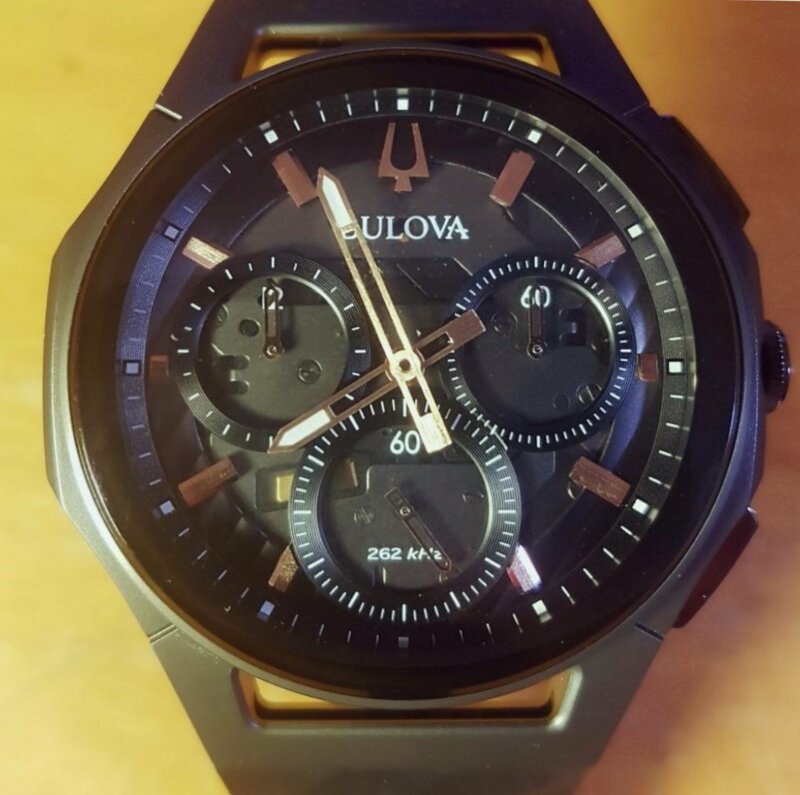 Consequently, because of the sports watch style of this model, it is a fine and fashionable watch doing something unique (at this price point) and a true home run for Bulova. “Well, what do think,” I asked Ibrahim passing him the Curv. He took a long look, “Very nice,” he said smiling and turning it over in his hands. He handed it back and I put it back on. He took it in on my wrist. 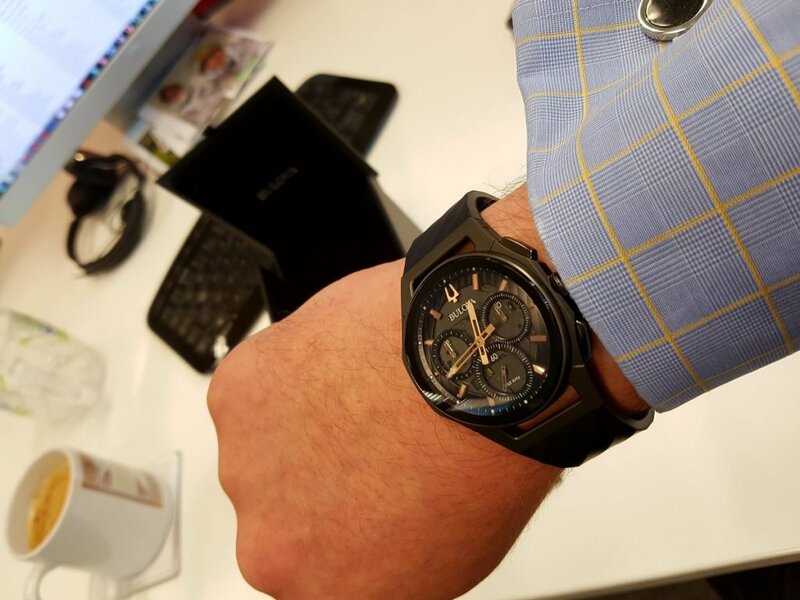 “I think that this is the nicest watch you have ever worn in the office”.